When we were growing up, our parents made it a priority to go on family vacations. These vacations weren’t always large or extravagant, but they were just time spent together as a family somewhere fun (even if that meant driving 20 minutes to the nearest campground). Well, with 6 daughters, I can sure you can imagine what our idea of “roughin’ it” was . . . camping wasn’t really our thing (nor our mother’s thing). 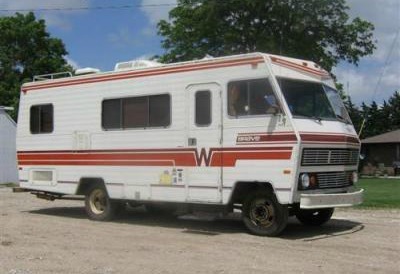 So in the early 1990’s, our family purchased a 1978 Winnebago Brave Motor home. We took that RV all over the country- we traveled to Yellowstone, to Disneyland, to visit family in faraway states, and even just up the canyon by our house for a quick little getaway. We ended up selling that motorhome after about 10 years, but the memories that we made in it will last a lifetime. I remember as we would drive to our destinations, our parents had an old TV and VCR that they rigged in the back so that we could watch movies as we traveled and it was THE COOLEST THING ever. It made those long road trips such a breeze! Plus, it was so nice to have a place to sleep and live once we arrived at our destination. Fast forward to today – every year, my husband’s family has a large family reunion in the quaint town of Donnelly, Idaho. 🙂 It’s about an 8 hour drive from our home in Utah and every year, one of our kids gets car sick. The whole time I try to entertain sad kids in the backseat who hate the drive and it about does me in. By the time we arrive, so I am so tired and grumpy that it almost makes the entire trip not worth it for me. So this year, I presented my husband with the idea of renting an RV for this family reunion. With my sweet memories of traveling by RV when we were growing up, I knew that it would not only make the drive that much easier, but it would also mean that I didn’t have to sleep in a tent! I did some research online and discovered that while there are a lot of nationally known RV rental places, many of them have terrible ratings and horrible customer service. I then stumbled across 5 Star Rentals – this is a great tool for finding RV Rental dealers in the United States that have a perfect 5 star rating. From there, I clicked on the map that showed all the certified 5 Star RV rental dealers in the United States and discovered Access RV was only a couple minutes from my home. I read their reviews and decided to put them to the test. I sent Access RV an email inquiring about renting this RV and within hours, I had received a friendly response. I quickly booked our trip and was impressed that all of the scheduling and most of the paperwork was done online, which was so convenient. On the day of our trip, I headed to the Access RV dealership and within minutes, we had signed the final papers and I was on my way. Their customer service was amazing and they walked me through the motor home to show me all the things I needed to know when it came to driving and operating the vehicle. Holy cow- this thing was LOADED! Definitely a HUGE step up from our 1978 Winnebago! We ended up getting a 27′ Class C Motorhome with a kitchen area that slid out a couple extra feet. This motorhome was a 2015 and had only a couple thousand miles on it. The motorhome was SPOTLESS and even smelled like a new car. Access RV’s cleaning staff even left us a little goodie bag tied with a bow to make our trip that much more comfortable. I was incredibly impressed. As I mentioned before, my kids have a tendency to get car sick. And bored. And they fight. And I lose my temper. And the only memories we are making are ones of mom putting the kids in time out in the car. It’s not pretty. 1. The ride there (no matter how far) is a BREEZE. Since we were going to be gone for 5 days, we had to pack enough food for that entire time (since we were going to be in the middle of nowhere, we needed to have basically everything we needed to survive). When we travel in our car and sleep in a tent, we have to pack all of the food, plus sleeping materials and clothing in the trunk and all around each person, leaving no room to even move (which makes the drive even more terrible). 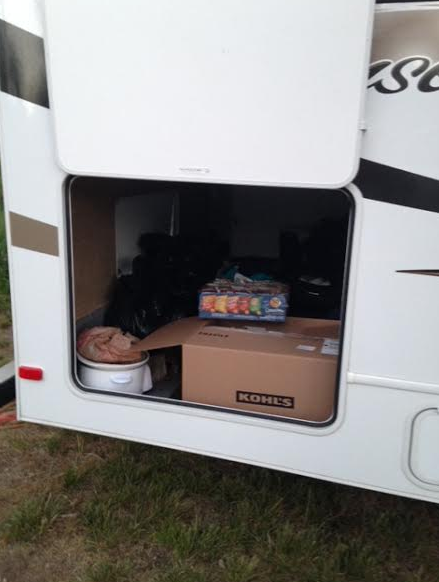 I love that RV’s have so much space UNDERNEATH so that you can pack everything you need with room to spare and have clean living quarters inside the RV. Let’s be honest- I am really not the camping type. I loved staying in an RV because it offered all the comforts of home away from home. I was able to keep food fresh in the fridge, heat up water in the microwave, use a flushing toilet, brush my teeth in the sink, prepare food in the oven (we have never eaten so well on a vacation! ), and have an AC kick on when it got too hot. I told my husband that we would never be able to go back to a tent! It really was the best of both worlds because my husband got his “camping experience” (family, campfire, beach, s’mores) and I got to have my “glamping experience” (glamour camping- I loved that I was able to stay clean and sleep in a bed with sheets!). 3. The toilet. When driving through the Idaho deserts and there isn’t a stop for hundreds of miles, this really came in handy! 4. Getting back to nature. As I mentioned before, we used our motorhome to drive to Disneyland when we were kids, but other than that, we really spent a lot of time in national parks, camping, and at beautiful places like Yellowstone. It was so nice to show my children that you don’t need an amusement park to be entertained, but that there is a lot of fun to be had around a campfire or spending the day at the beach, hiking with family, fishing, boating, and riding bikes. My kids loved being outdoors and getting dirty (and I loved that at the end of the day, the RV had a shower to rinse them off!). My kids thought that traveling and living in the RV (a.k.a. “The House Bus” to my 5 and 6 year old) was the coolest thing ever. They loved that they had their own little places to sleep in the RV, that it was their “house” on the road, that they could use the bathroom whenever they wanted, and that they could watch movies on a huge TV while we drove. Half of the fun of the vacation was getting there, which is NEVER the case when we are in the car. Not once did they ever ask “are we there yet?” because the ride was a huge part of the vacation experience! This vacation made my husband and I step back from our crazy lives and relax a little. We had 5 straight days without internet or any connection to the outside world and we loved every minute of it. Our kids loved our undivided attention and we got to experience new things together as a family. Our 6 year old daughter learned how to waterski, I learned how to wake board, our son caught his first fish, we went on family hikes, and we spent fun nights around the campfire talking and laughing. The daily grind of our lives can be crazy sometimes and it was nice to be able to just sit back and enjoy each others company. To say that our trip was amazing would be an understatement. Our kids had an incredible time and RV made all the difference for me as a mom. 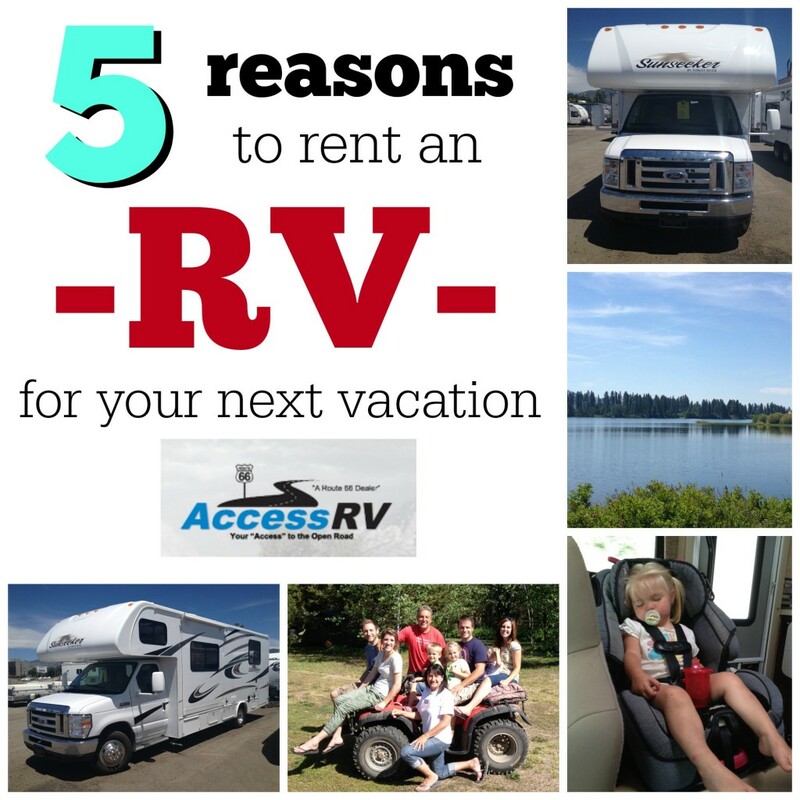 We all slept well each night, making our days a lot more smooth and our 2 year old even took a good nap each day because of the air conditioned RV.If you are looking to rent an RV, I highly recommend Access RV if you are in Utah or the surrounding states. For those of you outside of Utah, be sure to check out 5 Star Rentals to find a certified dealer near you- it will make all the difference! You can find Access RV on Facebook, Twitter, Instagram, and Google +. Plus, be sure to check out their YouTube channel where they take you on tours of their different RV’s and you can see for yourself how luxurious their RV’s really are!And if you decide to book through Access RV, let them know you saw it on Six Sisters’ Stuff and they will throw in a free cleaning for after your trip – they will take care of dumping out the waste and and cleaning it (most rental companies don’t even offer cleaning and make you return the RV fully dumped and cleaned)- and Access RV will do all the dirty work for you!Happy Travels! Camille!! This looks like so much fun. 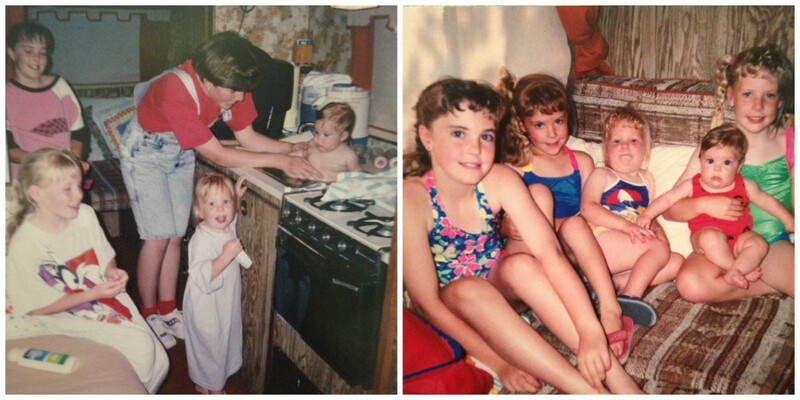 I love the pictures-of years past and of your darling family now. What a smart way to travel. I like your camping style! This post reminds me of the movie RV...A great movie! I'd love to be able to rent and RV and go driving around with the family. Memory making at its best!!! I want to start by saying I love your page and all the recipes you post. But I just want to let you know that riding in an RV is not safe for anyone because in an accident, EVERYTHING becomes a projectile. There is no way to secure everything since the cabinets, table, couch etc are not bolted to the frame. Thy are just glued to plywood. For that same reason, the seat belts are not safe to use either. And car seats can not be installed on any seat other than a forward facing one, so the only position a car seat can be installed in is the front passenger seat. I am sorry if I come across strong but I had several family members pass away from being in an RV accident for the reasons I listed above about why it isn't safe. I am very passionate about making sure people know how unsafe RV's are and don't want to see anyone else lose family members from something that is preventable. Just something to think about. Thank you for your time to read this and again I love your page and all the recipes you post! This post was awesome....I work for Winnebago Industries and they make some pretty awesome RV's!! So fun! Clark has the hardest time in a car seat but if we can do something like this, he would definitely be entertained. Looks like so much fun and thanks for linking up this week at The Wednesday Roundup! I am happy to have found this information about why one should rent an RV for an ideal vacation. It would be nice because one would be able to enjoy the great outdoors while still being able to profit from modern conveniences. It would be good to be able to sleep in a bed and have fresh food.